Exorcisms … are they the new black? 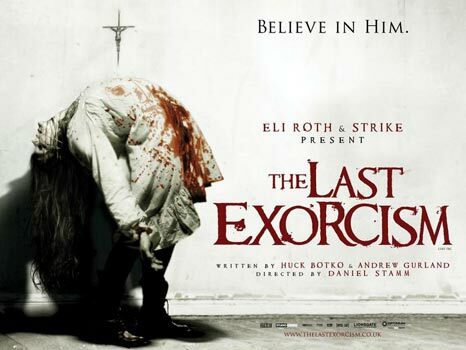 Ok… given my forthcoming book Torment is centred around an exorcism, I just had to see The Last Exorcism. Despite feeling a little let down by the ending, there is a hell of a lot to like about this film. The story: disheartened and maybe a little disillusioned Reverend Cotton Marcus sets out to debunk the “demonic possession” phenomenon by inviting two film students to accompany him to a farm in Louisiana where a young girl is believed to be possessed by Satan himself. The mockumentary style, like The Blair Witch Project, works in the movie’s favour. As the horror escalates, the viewer is drawn in – trapped with the characters. The acting IMHO is the real highlight. Ashley Bell who plays Nell is perfect, playing innocent one minute and frightening the next. Patrick Fabian, who plays Reverend Marcus is also believeable, playing the role of the con-man of the cloth with controlled strength. The middle section of the film is when the film really shines, as the “demon” takes control of Nell and terrorises everyone in the house. One scene where the “possessed” Nell borrows the camera is particularly unsettling. The Last Exorcism is probably one of the most well-acted horror films I have seen for some time and certainly deserves a place alongside Blatty’s The Exorcist. Let’s just hope they don’t spoil it by jumping on board the sequel train. But hey, that’s just my opinion.